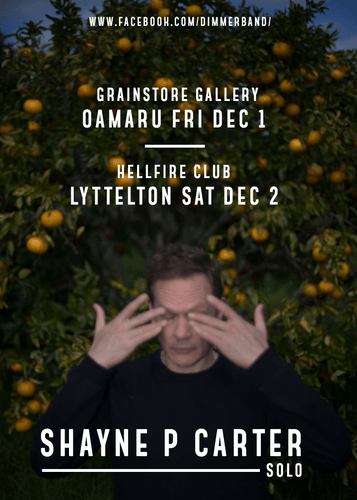 Shayne P Carter embarks on a special solo tour around the regions through December with dates in Oamaru, Lyttelton. Napier and Tauranga. Shayne will be performing songs from across his entire back catalogue featuring songs he wrote and performed in such bands as Dimmer, Straitjacket Fits, Doublehappys and Bored Games as well as last years Taite Prize finalist solo album “Offsider”. Shayne is one of New Zealand’s most celebrated musicians having first emerged in the initial wave of Flying Nun “Dunedin Sound” bands in the 1980s. He’s gone on to perform and record internationally since then releasing records through such esteemed labels as Rough Trade, Sub Pop, Arista and Flying Nun. He had been the receipient of many music awards including New Zealand Music Awards for best vocalist, best album, top group and Bnet awards for best album and most outstanding musician. He is a member of the New Zealand Music Hall of Fame and received a Bnet Lifetime Achievement award in 2008. Recently Shayne has returned to his hometown of Dunedin and is currently writing a memoir by the sea at Aramoana. He recently toured Asia playing live guitar with Atamira Dance Company and was the Music Director at this year’s Silver Scrolls which were held in Dunedin for the first time in September. In November he was special guest on Bic Runga’s Drive 20th anniversary tour and performed several of his compositions at Tally Ho 2 in the Dunedin Town hall - a special event of Dunedin songs rearranged for performance with the Dunedin Symphony Orchestra.